NDEO is calling all students and National Honor Society Dance Arts (NHSDA) members to participate in the Thank A Dance Teacher fundraising campaign to sharpen skills in charitable giving and activism. This student program will build upon the Thank A Dance Teacher fundraising model that was successfully launched in December of 2014 to raise scholarship money and awareness for dance education on Facebook and Twitter. 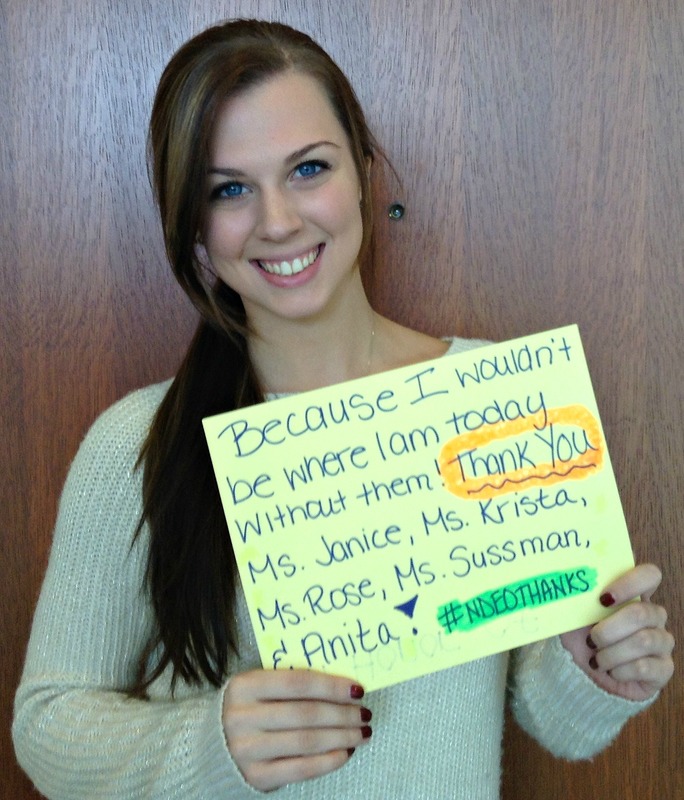 Student groups or NHSDA chapters may start their own Thank A Dance Teacher giving campaign. This may be done year-round and tailored around the school year. It can also be held in conjunction with the NDEO Thank A Dance Teacher end-of-year giving campaign, which runs from Dec 1-31. Step 1: Choose a campaign date range, establish a monetary goal, and create strategies to achieve this goal. Step 2: Contact NDEO Special Project Coordinator, Lori Provost at lprovost@ndeo.org with your pledge amount. Lori will send you a link to your chapter’s special NDEO giving page. Step 3: Build a campaign website or social media event page and list clear instructions, including that all participants should post videos and "unselfies" thanking their dance teachers and donate $10 for each dance teacher they thank. Donations will go directly to NDEO to help support professional development for dance teachers that will directly benefit students. You are now ready to fundraise in support of quality dance education and your future! *In January, of each year NDEO will tally all donations made through your chapter’s donation page. Schools that meet the following requirements will receive the complimentary NDEO benefits listed below. 1. Every NHSDA chapter that raises a total of $100 or more will receive a $40 coupon that may be applied to the purchase of Honor Society pins and cords. At the end of each year, the results will be tallied and schools that have raised a total of $100 or more will be emailed a coupon code in January for one-time use. 2. The top 3 schools that raise the most amount of donations will be announced on NDEO's Facebook and Twitter pages. A feature story will be written about the 1st place school in NDEO's NHSDA Newsletter. The 1st place, 2nd place, and 3rd place schools will also be featured in an article in NDEO's Dance Education in Practice Journal. 3. All schools that meet and supersede pledge amounts will be listed on NDEO's Donor Registry. 4. Participation in #NDEOStudentThanks may also go towards NHSDA points. #ThankADanceTeacher is a global movement to shine the spotlight on dance teachers. It was started in 2014 by the National Dance Education Organization to inspire fundraising and social action for dance education on Facebook, Twitter, and Instagram.The goal of #ThankADanceTeacher is to financially support the professional development of dance teachers to impact teaching excellence in the field. NDEO urges dance enthusiasts of all kinds (dancers, students, teachers, dance dads & moms, fans, etc.) to take the Thank A Dance Teacher Challenge by posting videos or "unselfies" on social media December 1-31, 2015 and give to the Thank A Dance Teacher Fund.